After two Rottweiler dogs killed a five-month-old girl, questions are being asked about the laws surrounding dog control - and the nature of the breed itself. WHAT LAWS COVER DOG CONTROL IN THE UK? Dog ownership in the UK is covered by various laws, the most well-known being the Dangerous Dogs Act 1991. This was drafted at speed after a string of savage attacks, and has been much criticised. It bans the breeding and sale/exchange of four kinds of dog - the pit bull terrier, the Japanese tosa, the Dogo Argentino, and the Fila Brasileiro. It also bans any other dog "appearing... to be bred for fighting or to have the characteristics of a type bred for that purpose". This particular wording has led to many complicated, and ridiculed, discussions in courts about what exact type a particular dog is. Furthermore, the act covers any dog which is "dangerously out of control", but only on public property or where it is not allowed to be. It does not affect a dog if it is in its own home. Also bans all dogs "appearing... to be bred for fighting or to have the characteristics of a type bred for that purpose"
Also covers any dog "dangerously out of control"
Out-of-control dogs can be seized and destroyed, and the owners faces a fine or up to six months in prison. If the dog injures someone, that can be up to two years. Other pieces of legislation include the Animals Act 1971, which says the keeper of an animal is liable for any damage it causes, the Guard Dogs Act 1975, and the 1871 Dogs Act. The 1871 act says any person may make a complaint to a magistrates court that a dog is dangerous, or report the matter to the police, and the court may order it to be controlled or destroyed. The Animal Welfare Bill, which is going through Parliament at the moment, will also include codes of practice for keeping dogs. Northern Ireland has its own, slightly different, set of legislation and still has a dog licensing system, where licences must be bought for a standard fee of £5 a year. Ken Knuckles, whose four-year-old daughter Anna needed hours of surgery after being attacked by their neighbours' Akita in its own home in Carmarthenshire 18 months ago, says big loopholes remain in the law. In their case, their neighbour did not want the dog put down - so it is still living next door to them. "We're still living with that dog beside us, because the dog law protects the dog in its own home, no matter what the circumstances," he told BBC Radio Five Live. "This dog came within two seconds of killing my two-year-old, the dog law says it's OK... to me, the law has to be changed, something's wrong." But Patricia Hewitt, health secretary and also the MP for the Leicester area where the baby was killed in the latest case, said it seemed the law had already been broken in this case. "As I understand it, quite apart from the Dangerous Dogs Act, you're not allowed to keep guard dogs unless they are under control, unless there is somebody with them who you know is properly trained to handle them, and of course they should be tethered. "The police will be investigating this but I think the first thing we've got to establish is whether the owners of the dogs were already committing a criminal offence." However, a complication here may be that if the dogs - which have been destroyed - were legally defined as family pets rather than guard dogs, they might not be covered by such legislation. 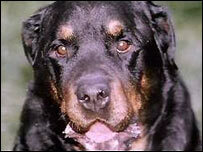 IS THE ROTTWEILER A DANGEROUS BREED? Annie Colbourne from the Rottweiler Welfare Association says Rottweilers are "beautiful, faithful and intelligent", and make good pets as well as guard dogs - in the right circumstances. "People get a Rottie and think 'OK I've got my big dog, here it is', well that big dog has a big brain, and that brain needs to be kept active," she says. "You cannot have a dog indoors, 24 hours a day, doing nothing, it will go stir-crazy. "They are very, very intelligent and very eager to learn, and if you don't channel that then you're going to have a problem. "This is where the problem comes, I think, with guard dogs - because people just keep them as guard dogs and don't keep that mind, that brain, activated in the right direction." SHOULD DOG OWNERS BE TRAINED OR LICENSED? Ms Colbourne said anyone thinking of getting a Rottweiler should make sure they go to training classes for both obedience and socialisation. She added that she would personally like to see a system of dog licensing re-introduced throughout the UK. "If you had to be licensed for your dog, and you are inspected to see if you are a suitable owner, something like that would be absolutely wonderful." Jeanette Thompson, whose son was attacked by her own golden retriever about 20 years ago, agreed about the need for owners to be trained. "This isn't simply about legislation," she told Five Live. "It's about getting funding to make sure that people who buy a dog... are actually given advice with them. "You don't have a car without a logbook, now you don't own vehicles without having to take some sort of test or awareness." Ryan O'Meara, who is editor of K9 Magazine and owns a Rottweiler himself, said no dog was "perfectly safe" and should always be kept under supervision when young children were around. "They're an animal and it is very hard to gauge how they will react while you are not there," he told Five Live. "I don't blame the breed, I blame anyone that leaves their child alone with any dog of any kind." Ms Hewitt told Five Live she would discuss with other ministers the possibility of introducing a training and licensing system for dog owners. However, she warned: "Unless we're going to take the step of saying that a family with a child isn't allowed to own a dog, it seems to me the law is unlikely to be able to rule out every possible tragedy of this kind."